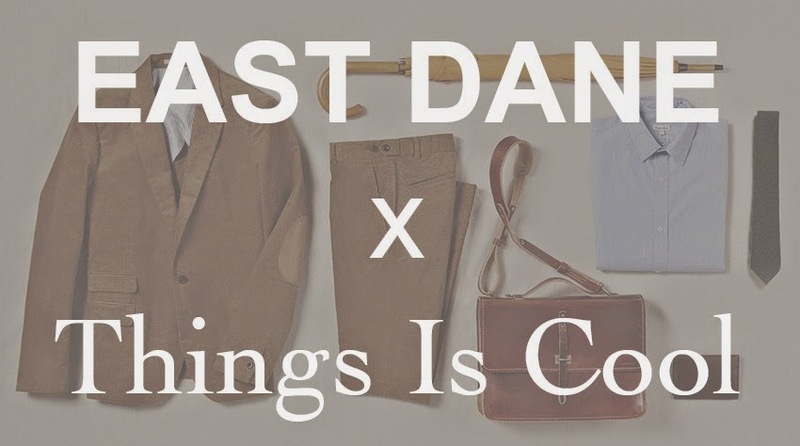 East Dane, the online menswear retailer, is offering Things Is Cool readers the chance to win one of four $50 gift certificates. You are immediately excited. Your mind drifts to thoughts of new sports coats and goodyear-welted shoes. You recall that East Dane even has an extensive sale section with 50% Off Mens. You decide to enter this contest. Leave a comment below stating your favorite item(s) with link(s) from East Dane. The entry period closes at midnight Eastern on September 30. The four winners will be announced in this post on October 1. Huge thanks to everyone who entered, and congrats to the winners! So simple, so clean, so money. If I win Ill finally be able to afford this bag. I am a huge fan of comfort, so this nostalgic hooded zip sweatshirt speaks to me. Definitely all about this trench from Hans Kjobenhavn. Gonna head into the mountain with these boots if i win. gorgeous travel kit? yes please. and these in a women's 6.5? yes please! I really like Dane's look. my favorite item would be the apc petit standard denim in black - http://www.eastdane.com/petit-standard-washed-jean-apc/vp/v=1/1554611746.htm?folderID=20481&colorId=12631 - been looking to step up from my levi's, and apc are some of my favorite jeans i've ever tried on... would love to be able to put some money towards funds! The sports jackets are dope!